More than 400 IC students—from 35 different departments and majors—participated in the 18th annual James J. Whalen Academic Symposium last spring. The Whalen Symposium is a chance for students throughout IC to present creative works and research on any topic that interests them. It’s unusual for undergraduate students to have the opportunity to make presentations at research conferences. 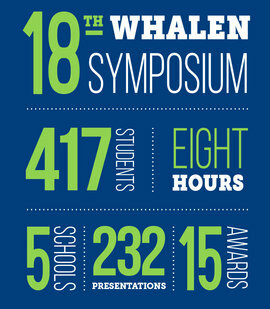 And for many, the Whalen Symposium is just the beginning as students go on to present their findings at regional, national, or international conferences, including the National Conference on Undergraduate Research. Visit the links below for three examples of original student research projects.